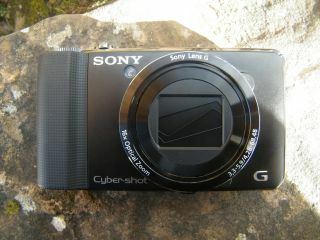 Sony's latest range of Cybershot cameras is being shown off at Focus On Imaging in Birmingham this week, and TechRadar was invited to get hands on with the range. Not quite the flagship – that goes to the Sony DSC-HX100V – the Sony DSC-HX9V is the highest-end camera Sony is releasing in a traditional compact chassis, and it comes equipped with some big numbers. The entire series this year is powered by the Exmor R CMOS sensor, which offers 16.2MP picture quality. Alongside this is a 16x optical zoom, which is impressive given that the camera is only 104.8 x 59 x 33.9mm in size and weighs just 215g. In the hand we found that the HX9 fits well, with a hefty grip on the front. This means that, when taking images, your hand doesn't impose on the mode dial and the like on the top. In our tests – and bearing in mind this is a pre-production model – the zoom did feel a tad sluggish. While we thought this was to do with the camera buckling under the fear that we trying to push it to the full 16x, it turned out our model needed some firmware tweaking. When we tried another version of the camera, the zoom worked at a much more acceptable speed but never made you feel like you weren't in control. This ensured smoothness and definite picture clarity. On the back of the Sony HX9, there's a 3.0-inch LCD that's been given 921600 pixels. Even in the brightest sunlight, the LCD worked extremely well and there were a number of optional on-screen graphics to help you compose your shots. As with the rest of the top-end of the Cybershot range, there's a lot of high-end technology within the HX9. For a start, there's GPS, as well as a dedicated 3D button. Shoot images when on this feature and you will be able to playback them on a 3D-ready screen. Sony has also pushed its HD shooting to progressive, with the HX9 capable of 1080/50p images. Couple this with a re-jigged Sweep Panorama mode – it does 3D and creates images that are effectively 40MP in size – and what you have is a very capable compact. The Sony DSC-HX9V UK release date is late April, with pricing to be around the £330 mark.